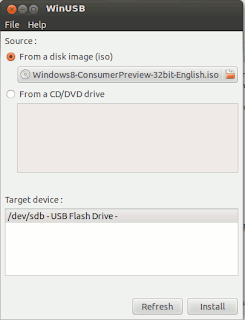 Creating Ubuntu USB Installer a.ka. 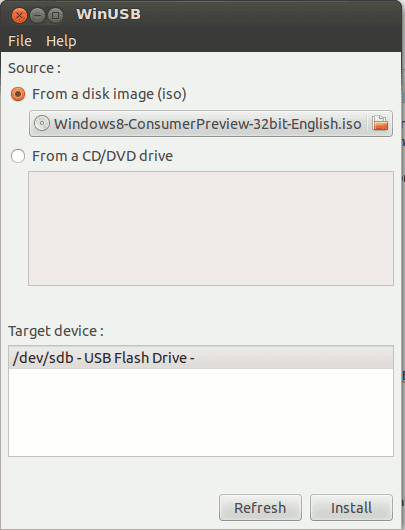 Ubuntu bootable USB from Ubuntu itself is easy. But, what if we want to help our friends or even our families who still use Windows to create Windows bootable USB? Can we create it on Ubuntu? Yes, you can, by using WinUSB. Before using WinUSB please prepare either Windows DVD installer or its ISO image and a USB flash drive with at least 4GB capacity. The USB drive will be formatted, so please make a backup before proceeding. 5. Select the appropriate USB drive at the "Target device"
Please sit back while WinUSB does its job!